While actress Milla Jovovich may be trying to draw in your attention with talk of extraterrestrial owls and an imminent fear of the fourth kind, there’s a phenomenon that has been slowly gaining momentum in the music world…. Bands and musicians have been switching members and pairing up like Xenon Octa-Flouride (XeF8) would, if it ever is going to be invented (thanks Wikipedia!). In layman’s terms, we’ve been getting a lot of new supergroups, side projects, and collaborations – some that could have been foreseen, and others that seem to have appeared out of nowhere. Now, the idea of a supergroup is not a recent innovation by any stretch of the imagination – the supergroup goes all the way back to the Almanac Singers – a combination of Millard Lampell, Lee Hayes, Pete Seeger and Woody Guthrie that got its start in 1940. From the 60’s until today, we have been given plenty more supergroups, such as in 1969 which brought us both The Plastic Ono Band (which included the likes of Eric Clapton, both George Harrison and Ringo Starr, Keith Moon and Alan White – just to name a few) as well as Blind Faith (which also featured Mr. Clapton, but had Ginger Baker, Steve Winwood and Ric Grech to boot). 1988 brought us the Traveling Wilburys, which was the tour de force of George Harrison, Jeff Lynne, Roy Orbison, Tom Petty and Bob Dylan. And although they Wilburys only stuck together for about a year after Orbison’s death, that cosmic aligning is something that has not met it’s match… yet. Among the recent crop of supergroups is a group I mentioned last week – The Monsters of Folk, which consists of folk songsters Connor Oberst and Mike Mogis from Bright Eyes, M. Ward of She & Him, and Jim James from My Morning Jacket. They’ve been associated under the Monsters name since 2004, but have all been so busy with their respective main attractions that they weren’t able to release their self-titled first album until this year. You’ve definitely heard their track “Say Please” on the Peak – and both M. Ward and Connor Oberst gave free concerts in NYC this summer! Moving down the line from most folky to least, next up is the recent pairing of Death Cab for Cutie’s Ben Gibbard with Jay Farrar, member of Uncle Tupelo and frontman for Son Volt, the two bands that he played with throughout the 90’s before he launched his solo career in 2001. 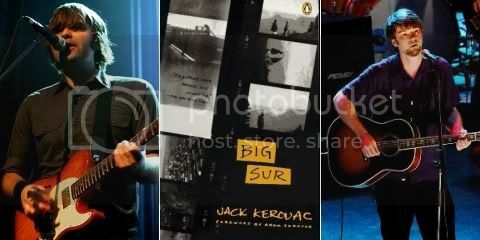 Gibbard and Farrar first got together in 2007 to record the soundtrack for One Fast Move and I’m Gone: Kerouac’s Big Sur. Both the movie and the album came out on October 20th, the day before the 40th anniversary of the prolific author’s death. You can see the music video for “San Fransisco”, the last track on the album, here. And you can expect to see more from them in the future. in the past couple of weeks i’ve been getting a band together for fun to play the eraser stuff live and the new songs etc.. to see if it could work! here’s a photo.. its me, joey waronker, mauro refosco, flea and nigel godrich. at the beginning of october the 4th and 5th we are going to do a couple of shows at the Orpheum Theatre in Los Angeles. we don’t really have a name and the set will not be very long cuz ..well …we haven’t got that much material yet! Of course, those shows were sold out in 20 minutes. Flea, as you know, is the Red Hot Chili Peppers Bassist – and he seemed to be ecstatic to be on stage with Yorke, playing cuts from Yorke’s solo album The Eraser (2006). There hasn’t been a follow-up to the October concerts, but that’s something you should keep an eye out for as well. Next up come two really driving groups. First is The Dead Weather, whose song “Hang You Up From the Heavens” I featured in my first week of blog-writing. The Dead Weather was formed by Jack White who’s been extremely active – leaping from the White Stripes, to the Raconteurs, to the recent release of “It Might Get Loud” – a documentary featuring White, The Edge, and Jimmy Page. 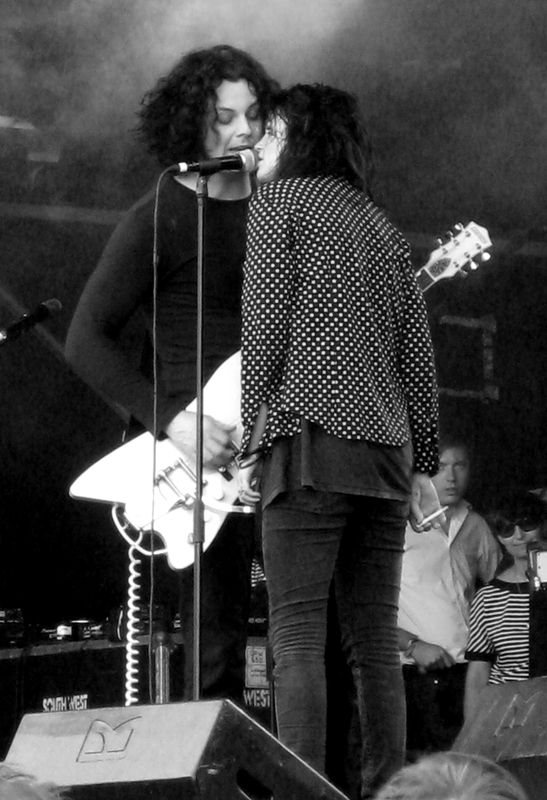 The band also features Alison Mosshart of the Kills on lead vocals, Dean Fertita of Queens of the Stone Age and Jack Lawrence, who played with White in the Raconteurs. And to sweeten the deal, they just announced a show at the Music Hall of Williamsburg on November 17th! Tickets for that are going on Sale this friday, so get ’em quick. And finally, we come to Them Crooked Vultures, or TCV as they call themselves. TCV is big news. On drums is Dave Grohl, from Nirvana and the Foo Fighters. On vocals and guitar is Josh Homme, from the Queens of the Stone Age. The kicker is that John Paul Jones comes soaring in on bass. They’ve got a really great sound, full and rocking, but what remains to be seen is whether TCV will be able to stay afloat once their star power has worn off. Their self-titled first record is due out on Sony in a week, which should be an insta-grab for all hard rock fans. But for now, check out the full album on the band’s website! So, I apologize about all the name dropping – it’s not something I routinely do. If you think a supergroup has been left out, please let me know. Or if you feel the need to justify the Tinted Windows‘ existence, by all means, please try. But if you do, I’ll kindly remind you that their lead singer is from Hanson, and we’ll go our separate ways. Wikipedia to the rescue once again! …And the horseman roams the streets at night… restlessly searching for his missing head. That of course, is from the Legend of Sleepy Hollow – one of my favorites, although no one knows how the ghostly Hessian soldier actually lost his head. I’m going to go out on a limb right now and say that maybe if he had known about all of the great concerts going on in November in his own backyard, he could have found some solace. November starts off with a bang – Pete Yorn, who performed live for the peak in 2006 will be playing at the Ridgefield Playhouse TOMORROW the 1st. He just released his fourth record Back and Fourth this past June and if you look at the fine print, you’ll notice that Mike Mogis of Bright Eyes helped produce it. What’s more, Yorn put out another album right after that, with Scarlett Johannson this past September – Relator. And coming off touring with Coldplay throughout the summer Mr. Yorn is doing quite well for himself – make sure to catch him in Connecticut! In addition to the free download, they have been giving away free tickets to their shows for servicemen and women through the USO. So support this noble band by seeing them next wednesday. Going back to Mike Mogis for a sec, the indie-folk supergroup, the Monsters of Folk, are playing at the United Palace Theater up in Washington Heights next friday, November 6th. These monsters include Mike Mogis and Connor Oberst, both prominent members of Bright Eyes; M. Ward – well known from his partnership with Zooey Deschanel called She & Him; and Jim James the singer from My Morning Jacket. I know, it’s a lot of names for one band. But it’s going to be a great performance. If you do miss them Friday, it wont be too late – they’re playing again at the Beacon Theater on Nov. 8th a week from this Sunday. Bruce Springsteen with the E Street Band at Dodger Stadium in Los Angeles in 2003. In the end, however, no one compares to the Boss. That’s right, Bruce Springsteen is blazing through town after his tour de force performance at the Rock and Roll Hall of Fame last week. Brucie and the E Street Band will have two performances at Madison Square Garden on Saturday and Sunday, the 7th and the 8th. Rob Thomas Peak Performance at ACME studios on Sept. 5th, 2009. That should tide you over for a few days, at least. We return then to the Beacon Theatre, where Rob Thomas will be performing a series of three shows on Thursday, Friday and Saturday the 12th, 13th, and 14th respectively. You may know that Rob Thomas came into the studios this past September, and he’ll be one of the featured artists on the Peak Performances Vol. 2 that’s coming out this December. And there’s so much more! The Cranberries will be playing at Nokia Theater on the 18th. After that, Bela Fleck and the Flecktones will be performing at the Community Theater at the Mayo Center for the Performing Arts on Friday the 20th, and the Smithereens will be following tham at the Community Theatre the on the 21st. Also, Ani DiFranco will be playing at Town Hall on the 21st as well. New York’s backyard will also be graced with three shows from the Pixies on the 23rd, 24th, and 25th at the Hammerstein Ballroom. Then November goes out with a bang, too, with two sold-out shows from Guster on the 27th and 28th back at the Beacon Theater. They’re touring right now for the tenth anniversary of their ’99 album Lost and Gone Forever. They’re playing two sets each with one set being the record in its entirety. That album has some truly great tracks like “Barrel of a Gun” and “Fa Fa”. So happy concert-hunting, and if you do seem to have misplaced your head, then let some great world class rock steer you home.